Clary and Jace are off on an adventure! 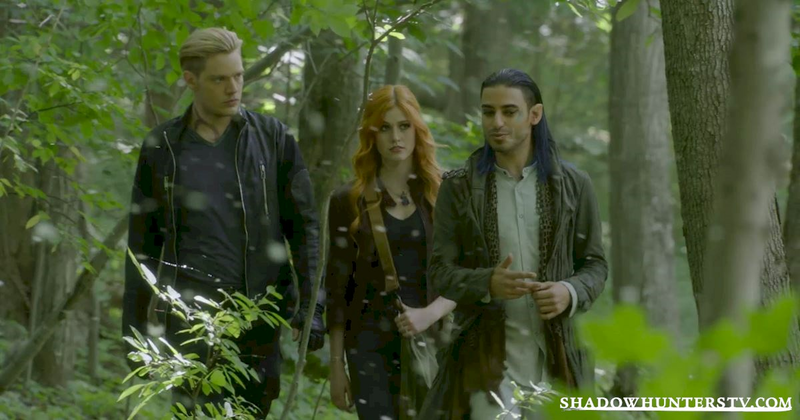 Meliorn brings the duo to the Seelie glade and explains that they can use Clary's necklace to find Valentine. However, they have to go into an alternate universe where the portal shard came from. This universe is different and Clary might forget where she came from unless she finds an anchor to keep her focused on the task at hand. Meanwhile, Simon pays Luke a visit at The Jade Wolf and later announces that he's the new Vampire ambassador to Werewolves (a title he made up). While talking to Luke, Simon accidentally shows his fangs to a pretty waitress and then admits that the transformation is like "going through puberty with less zits"! Into the portal we go! Clary gives Jace the Mortal Cup and says goodbye, before stepping through Meliorn's portal. She arrives into her own brightly lit apartment and discovers that Valentine is there! She instinctively threatens him with the closest thing at hand, a butter knife, before realizing that he's very different in this world. He and Jocelyn are in love and seem to be great parents; asking about her classes at art college and her new boyfriend. 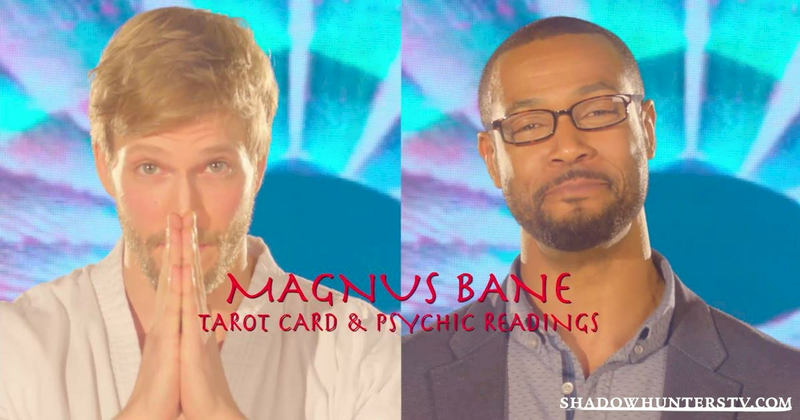 The TV in the background shows an advertisement for Magnus' tarot card readings. Both Luke and Hodge are in the ad as people whose lives have been changed by Magnus. Hodge has his own Dojo, and Luke owns a rare bookshop! The sight of Magnus seems to wake Clary up and she immediately runs off leaving her parents looking confused. Back at the Institute in the real world, Alec is worried that Raj might have spotted Izzy during Meliorn's rescue. Those suspicions are confirmed when Lydia apologizes to him before arresting Izzy for treason! Izzy accuses Lydia of hating Downworlders, just like Valentine, but Lydia insists she is simply maintaining the law. If Izzy is convicted she would be stripped of her runes and banished. Alec attempts to defend her but Izzy won't let him get involved. 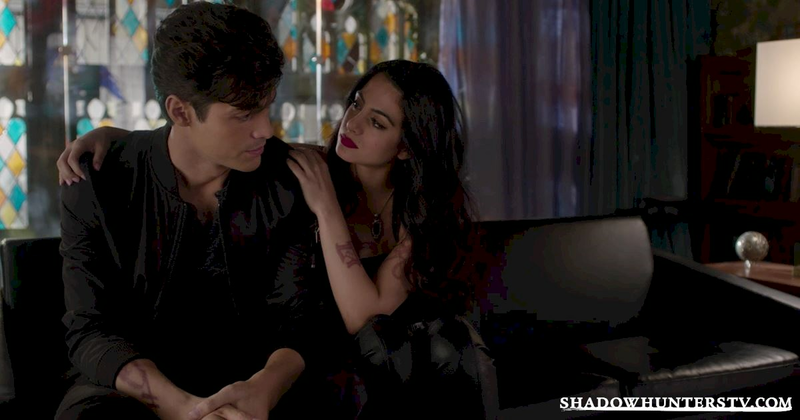 Later, Alec finds Lydia and offers to trade the Clave the Mortal Cup in exchange for Izzy's freedom. He leads an excited Lydia to the secret box where he hid the cup only to discover that it's already gone. 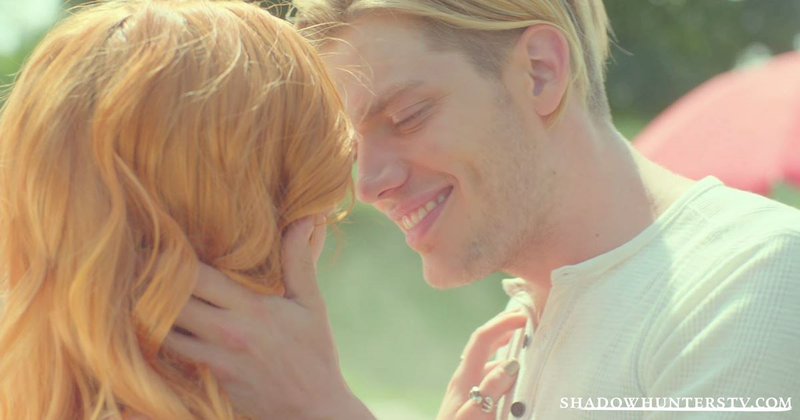 Back in the inverted world, Clary sees Simon standing out in the sun and tries to push him into the shade before realizing he is not a Vampire. Izzy and Alec are drinking coffee and discussing the anniversary party that will be taking place in the Institute that night. Apparently the theme is "Ah-mazing". Jace serves up coffee in "Java Jace" and is completely smitten with Clary. They are making out behind his van when she suddenly seems to "wake-up" and runs off to continue her mission of finding the portal. Alt-Clary spends a lot of time running off suddenly. Simon and Luke are in trouble with the law! Back in the real world, Simon and Luke are having a deep conversation about everything that's been going on. They both agree that Clary could be a strong leader, seemingly impressed by her ability to get the Vampires and Werewolves to work together. 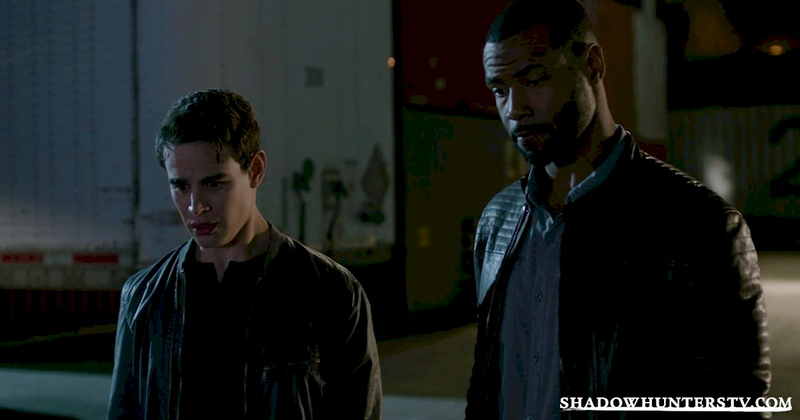 Simon reveals that he just wants to go home, but Luke reminds him that he won't be able to until he learns to get his Vampire impulses under control. Their discussion is interrupted by the Internal Affairs Officer who suspects Luke of being the demonic killer that drains people of their blood. Luke stays calm but Simon gets agitated and knocks him out! Chairman Meow and Church finally make an appearance! In the alternate reality, Clary is visiting Magnus for a tarot card reading. He tells her that her relationship with Jace is strong but that secrets revealed could threaten to tear them apart. Clary seems confused and concerned by the reading, but she soon admits her real reason for visiting him: she's a Shadowhunter from another dimension looking for the portal. Magnus seems skeptical at first but then admits he's a Warlock. However, his powers have been dormant for such a long time that he doesn't think he'll be able to help! 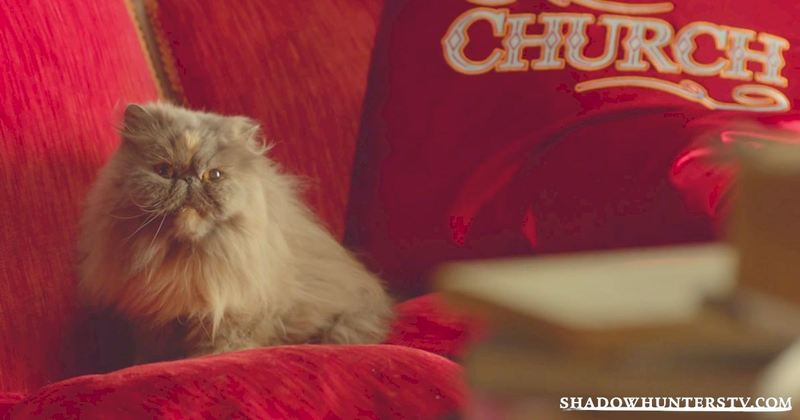 We also get to see his cats; Chairman Meow, who is adorable, and Church, who is super scary. Alec is not very happy with his parabatai! 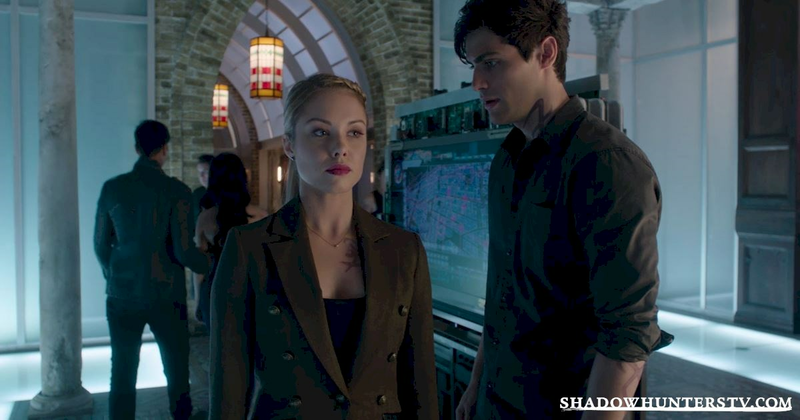 In the real Institute, Alec confronts Izzy about the missing Mortal Cup. She confesses that Jace has it and Alec accuses her of betraying him. 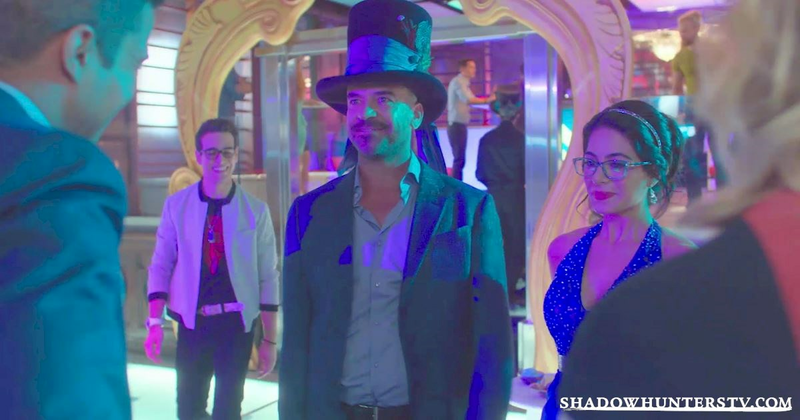 He believes that the Clave need the cup to protect the Shadow World from Valentine, and he now has nothing to trade them for Izzy's freedom. He is determined to track down Jace through their parabatai bond. 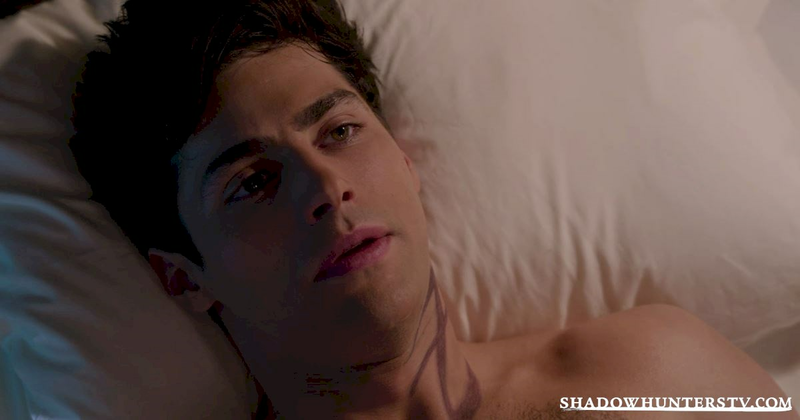 Izzy begs him not to as it could weaken or destroy their bond, but Alec is adamant. He claims that Jace already weakened the bond by stealing the cup. In the meantime, Jace and Meliorn are waiting for Clary by the portal. Meliorn hears a noise and suspects that dark forces are lurking nearby. Alternate Magnus is still struggling to awaken his dormant magic. He tries drinking some disgusting tea but still can't even perform the most basic spells. Clary tries to inspire him by imitating his usual "flourish" style, but to no avail. However, once he touches the portal shard that Clary has brought with her he feels a jolt and seems to regain some of his powers. He uses the shard to track down the portal from which it came. Magnus is worried they won't be able to get into the Institute to access it. Clary informs him of the party and seems confident that she'll be able to get his name on the guest list. She then receives a 911 emergency text from Izzy and runs off to find her friend. When did Simon become a serial killer? In the real world, the Internal Affairs officer wakes up to find Simon lurking in the shadows with a siphoning machine that can be used to drain the human body of blood. He accuses Simon of being the demonic killer and Simon doesn't deny the charge. He walks slowly towards the officer with the medical tool in his hand as the man tries to move his chair as far away as possible. Just when it seems like Simon is actually going to kill this man, Luke appears and shoots Simon several times in the chest. Simon falls backwards onto the ground and Luke tells the IA officer: "I told you it wasn't me!" 10 Years Through The Looking Glass! Izzy is crying because she has a bruise from kickboxing. Clary offers to cover it with make-up in exchange for getting Magnus' name on the party guest list. The Institute is beautifully decorated for the party. Valentine and Jocelyn dance together before Jace arrives and nervously meets Valentine for the first time. Jace insists that Clary dances with him as she has been ignoring his texts all day. As they dance, Clary appears to forget about Magnus and her other life. Alec, what are you doing? The real Alec tells Lydia and Hodge that he is going to locate Jace through their bond. They are both as against it as Izzy was but they agree to help him. Hodge makes him promise that he won't let the spell break their parabatai bond. 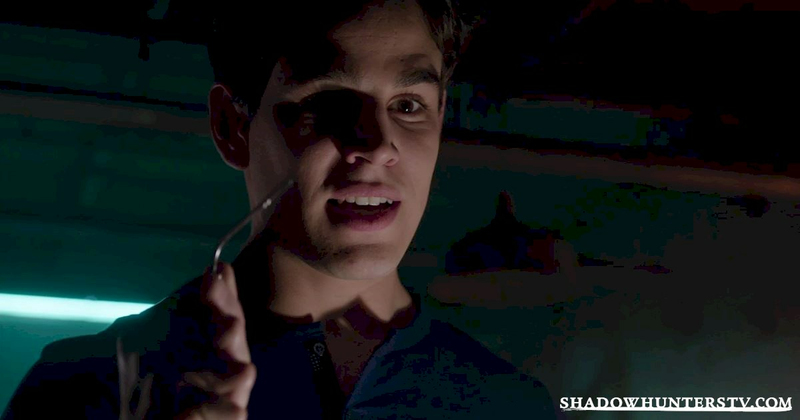 Alec insists that he has to do this to save Izzy. He lies down as Hodge draws the special rune on his skin. In the meantime, Jace and Meliorn fight some demons to prevent them going through the portal after Clary. Alec's spell effects Jace as he is in the middle of the fight. He falls to the ground and both he and Alec call out each other's names in pain. While Jace is unconscious, one of the demons manage to get through the portal. Malec and Clace are thriving in this world! Back in the alternate Institute, Raj is denying Magnus entry to the party. 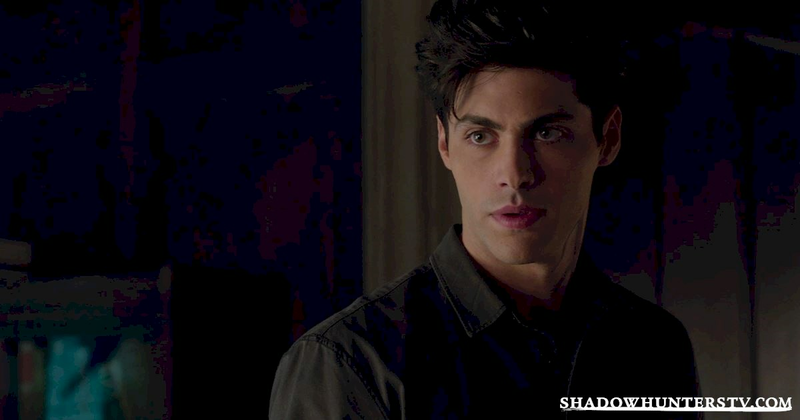 Alec, who has been lurking nearby, escorts Magnus into the Institute and offers him a drink. 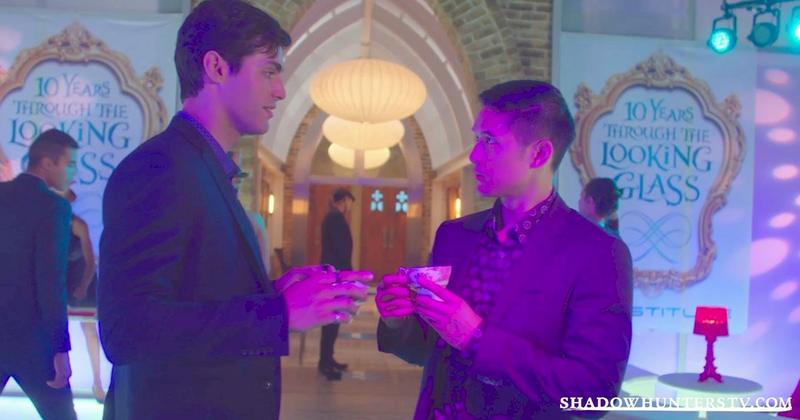 He seems very interested in the Warlock, but Magnus spots Clary and abandons him in the middle of their conversation. 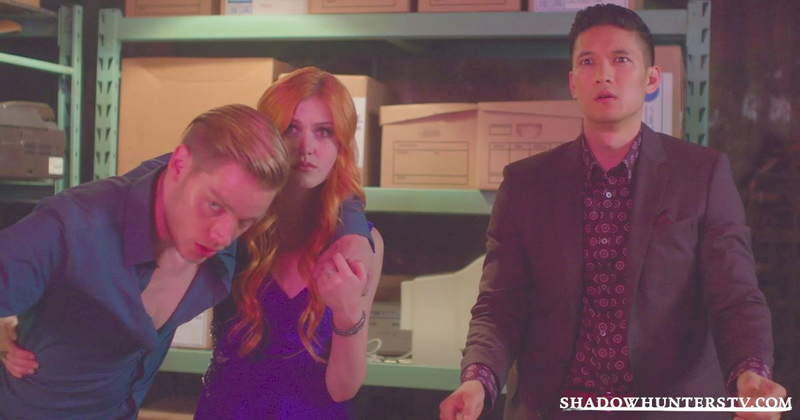 Clary and Jace are having a romantic moment on the dance floor when Simon interrupts them. Jace makes a joke about Simon stealing his girl and the two laugh before he leaves them together. 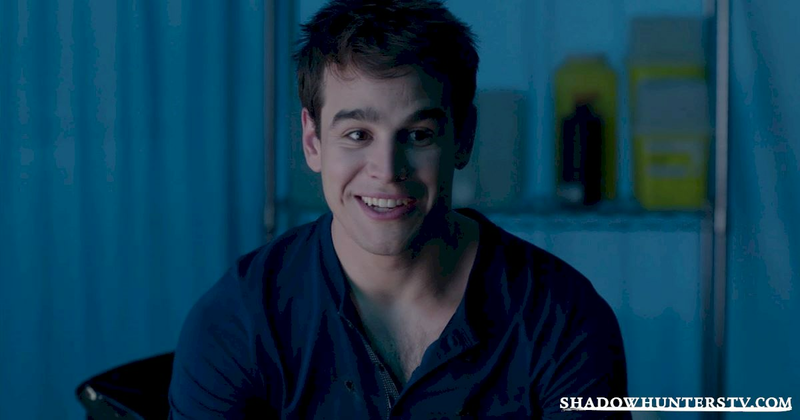 Simon wants Clary's opinion on whether he should ask Izzy to move in with him. She tells him to do it, and he heads over to where join his girlfriend on the dance floor. Magnus tries to get Clary's attention but she seems to have forgotten who he is. He shows her some of his magic and manages to wake her up again. Jace sees them together as they run down to the basement. Back at the police department, Luke and the Internal Affairs officer are talking about finally catching the demonic killer. They are standing by a body bag in the morgue. Alaric arrives as the officer leaves and Simon appears out of the body bag. He is very proud of himself for playing the role of a serial killer so well. Luke and Alaric assure him that he is a real friend of the Werewolves now. That portal is nothing but trouble! In the alternate reality, Jace sees Magnus and Clary together looking for the portal and suspects they are having an affair. As he is breaking up with Clary, the demon that went through the portal appears and attacks. 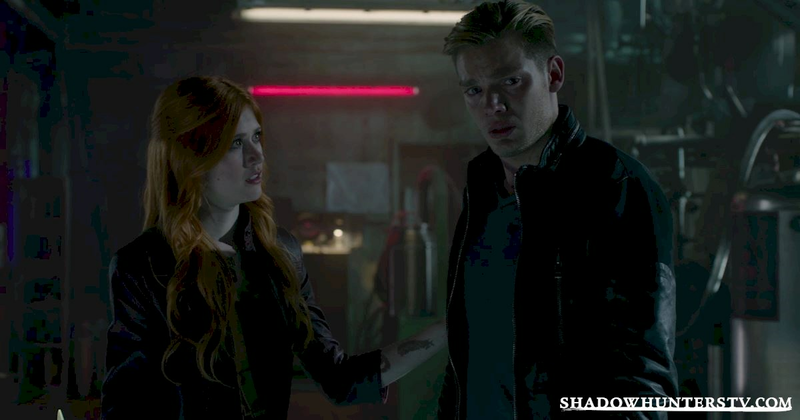 Clary manages to save them but Jace is terrified. In the real world Jace wakes up to find Meliorn standing over him. Once he finds out that a demon has gone through the portal, he insists on going after it. He appears in the body of alternate Jace and helps Clary to kill the demon in the alternate universe. During the fight, the demon stabs Jace and injects him with venom. Even though he's injured, Jace insists on going through Magnus' portal with Clary to find Valentine. Magnus closes the portal behind them to keep his universe safe from more demons. The Lightwoods are not having a good day! Alec and Lydia arrive at the Seelie glade after the portal has been closed so they are unable to find Jace. Back at the Institute Alec goes to visit Izzy and confess his failure. He admits that the parabatai bond is extremely weak, like a "ghost". He's also upset because now Izzy will definitely be put on trial by the Clave. Izzy tries to comfort him. Clary and a very weak Jace arrive at Valentine's lair in Chernobyl. Jace tries to heal himself with a rune but it doesn't work fully. They see some of Valentine's experiments and worry about the army he is creating. They hear a noise coming from the locker at the end of the room. When they open the door Jace is completely shocked to see his father, whom he believed to be dead, huddled on the ground. The man looks up and calls out his name as Jace stares back at him in disbelief. What was your favourite part of this episode?